NEW YORK (CNNMoney) -- The tornado season of 2011 will go down as one of the most destructive and dangerous in U.S. history. More than 1,500 tornadoes were reported this year, exceeding the 10 year average of 1,300, according to the National Weather Service. Even worse: An estimated 550 people have been killed by tornadoes, roughly 10 times the average annual rate, according to Greg Carbin, a meteorologist for the National Weather Service's Storm Prediction Center. And we haven't even entered the storm-heavy months of October and November yet. For Joe Zinser, the owner of Tornado and Storm Shelters.com in Flower Mound, Texas, this year's storm season has been bittersweet. He has sold more than 600 storm shelters -- twice what he typically sells in a year. "We can't build fast enough to satisfy the demand," he said. "If you order now, it will be January before you even get it in." An average basic shelter that seats eight people from his company costs about $5,000. Other storm shelter companies are also logging record sales. Robert Toll, co-owner of Arkansas Storm Shelters said he's had more inquires for his shelters in 2011 than in the previous seven years combined. Few homes in Joplin, Mo., were equipped with storm shelters when a devastating tornado hit the area in May. Last week, the city confirmed that two more people had died from injuries sustained from the storm, bringing the death toll to 162. "There was a laissez-faire attitude," said Keith Stammer, the city's director of emergency management. "The [previous] storms were never this deadly." Stammer applied to the Federal Emergency Management Agency (FEMA) for assistance in purchasing 3,000 new storm shelters. Some residents are not waiting for federal aid, however. The reasons they had for not buying a storm shelter in the past, like the expense -- shelters there can run as much as $10,000 once the cost of excavating the stony ground to install one is factored in -- now seem like less of an issue. 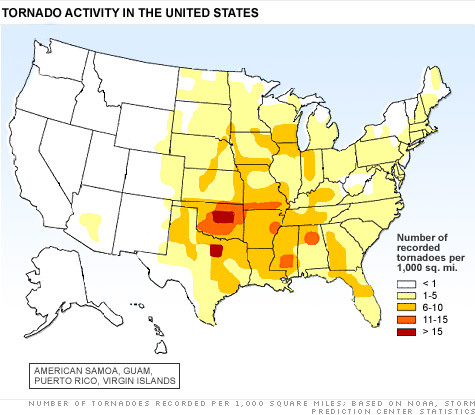 Tornadoes hit so haphazardly that it can be easy to dismiss their threat. When Steve Toth, a retired police lieutenant moved to Billings, Mont., from Anaheim, Calif., his homebuilder told him he didn't need a shelter. "The builder said he had never seen a tornado there before 2003," said Toth. "He said, 'What are the odds of another one hitting?'" Toth's wife, however, insisted on a shelter. Less than 10 months later, a tornado destroyed most of their house but he, his wife and his daughter's family were all safe. When his builder rebuilt eight homes in the area, he installed a storm shelter in each. Homeowners most in need of storm shelters live in the Midwest and South, especially in and around Oklahoma, where cold air systems coming off the Rockies hit warm, moist air from The Gulf of Mexico. Those ingredients, plus wind shears, produce more tornadoes than anywhere else on Earth, said Carbin. The most important thing to look for when buying a shelter is sturdiness. Not only must it be able to resist wind, but it also has to hold up to ground water and be able to resist corrosion. Look for shelters that carry a seal from organizations like the National Storm Shelter Association (NSSA), which test and certify shelters, according to Ernst Kiesling, a professor of civil engineering at Texas Tech University who runs the storm shelter research arm of the University's Wind Science and Research Center. There are two basic types of shelters, above- and below-ground. Above-grounds are usually made of steel and bolted to the concrete floor of a garage or basement. In-ground shelters are usually put in a trench. Whichever type you purchase, it's vital that the doors can be opened from the outside so rescuers can get in, and that air vents are positioned so that they won't get clogged with debris. Below-ground shelters should be positioned with an eye toward the normal direction storms blow in, said Toll. In most of Tornado Alley, storms come from the southwest. "The doors should open in that direction," he said. "That way, you don't have to pull against the wind to close them." Make sure the shelter is adequately weighted so it won't float up if the ground gets saturated with water. Locate the shelter in a place where it will have minimal outdoor exposure. You don't want to be running a long way through the storm to get to safety. Keep it away from flood zones. Tornadoes often accompany hurricanes or heavy thunderstorms and shelters are useless if they fill with water. Locate the shelter away from potential large falling objects. If a masonry wall falls over the entry, it can trap people inside. Make sure the shelter has been correctly bolted to a steel-reinforced concrete floor and that floor is in good condition. Keep the shelter separate from load-bearing walls. The doors should have three latching mechanisms for strength and those latches should engage easily so it's easy to get in and out.